No reviews yet for this trip. Browse other reviews below for SmarTours. Didn't want another week to end without informing you about the absolutely wonderful vacation of a lifetime in Abu Dhabi and Dubai! I cannot express in words the extraordinary tour our group experienced. From the beginning until the actual date of our trip (April 2-10, 2018) my experience with Smartours was phenomenal. Suzanne was wonderful in working with me for my birthday celebration group! She kept us on task and on time with deadlines, And even when it seemed I wasn't going to have enough for the private group, she encouraged me, going the extra mile to make it happen! Once we arrived, our tour director (Mohammed Saleem) went above and beyond providing our group with exceptional service! He represented Smartours with skill and expertise. He shared his impressive knowledge of culture and history of the region and encouraged us to ask questions about things we didn't understand. He was patient and kept us together and made sure no one was left behind, and that was no easy task. My travel group was consisted of people of all ages, some in their 20's, 30's, 50's, 60's and 70's. Having the right tour director can make a trip fun and exciting or dull, boring and frustrating. Mohammed was outstanding in engaging everyone in our group. He was truly the best Tour Director "In the WORLD" (inside joke).I highly recommend taking a PRIVATE group on this excursion. It is truly a wonderful opportunity. We have made new friends and created memories that will last a lifetime! Don't be surprised when you receive a lot of inquiries about other groups wishing to go to Dubai! I have passed along your information to everyone who asks! Thank you Smartours! Your exotic travel to Thailand begins as you depart today aboard your wide-body jet. Two days at leisure to discover Thailand’s vibrant and exotic capital at your own pace. Your Tour Director can make suggestions for independent exploration. Join an optional excursion to the colorful Damnoen Saduak floating market, reached by a rice barge followed by a visit to Phra Pathom Chedi, the tallest stupa in the world ($40). 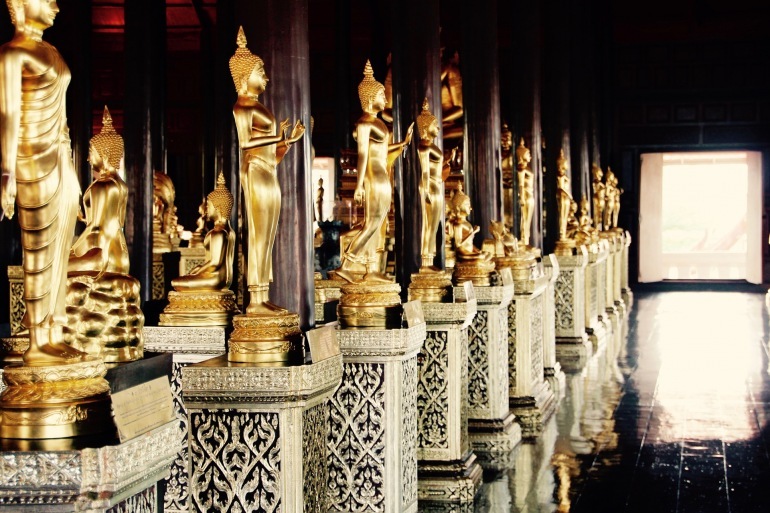 A tour of the spectacular Grand Palace, former residence of the Kings ($38) is also available. Both tours can be on either days 4 or 5 depending on the departure date. Day at leisure. Your hotel is located within easy access to the Mae Kok River. Today join an optional boat trip down the river and visit the fascinating local hilltribe villages, learn about their culture and observe the colorful costumes ($32). Morning drive to Chiang Mai, the “Rose of the North.” Your hotel is centrally located within a short walking distance to the renowned night market. Afternoon at leisure. Tonight we suggest an optional “Kantoke Dinner” featuring local specialties as well as breathtaking performance of songs and dances by a local hilltribe dressed in traditional costumes ($32, dinner included). Morning optional city tour visits Chiang Mai’s most interesting temples as well as fascinating Wat Doi Suthep located high in the mountains ($28). Tonight, enjoy a classic Thai cooking class and delicious dinner experience with your fellow travelers. Whether you want to try cooking Thai food yourself or not, you’ll surely walk away having enjoyed a delicious meal! Today fly to Phuket where the balance of the day is at leisure. Your hotel is ideally located at Patong Beach, overlooking the ocean. Continue your leisurely stay on your magnificent Phuket island! 14 Breakfasts and 2 Dinners.